Rather than choosing one or the other, Zinedine Zidane will opt for both Karim Benzema and Alvaro Morata to lead the attack given Cristiano Ronaldo’s absence. Throughout this season, one would normally come on for the other around the 70th minute mark, but against Sevilla in the Copa del Rey last-16, circumstance will force a change in the French boss’ usual strategy. With two pure strikers or No. 9s, it should be interesting to see how they attack Jorge Sampaoli’s preferred back three, not to mention the chemistry between them. Against Lega Warsaw in the Champions League the two played together, but not as two up front, as Morata played left wing that day. This time around a switch to a 4-4-2 is a distinct possibility. 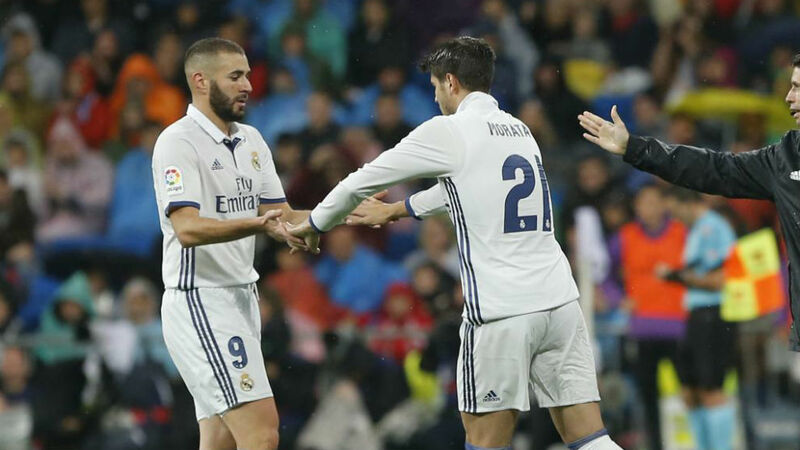 With 143 minutes together in tandem, it’ll be a different side from Zidane against a tough opponent, although Morata has been fine with being Benzema’s sub and will look forward to the chance to play alongside him. Decisive in the Club World Cup, Benzema is back to his best, with 10 goals this season, thus far, silencing critics and any doubts that Morata should take his place, at least for the time being.